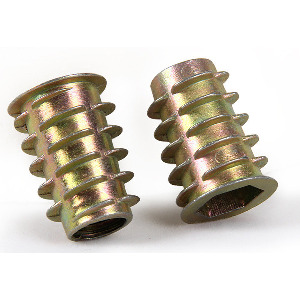 M4 Zinc Alloy Threaded Wood Caster Insert Nut with Flanged Hex Drive Head. M5 Zinc Alloy Threaded Wood Caster Insert Nut with Flanged Hex Drive Head. M6 Zinc Alloy Threaded Wood Caster Insert Nut with Flanged Hex Drive Head. M8 Zinc Alloy Threaded Wood Caster Insert Nut with Flanged Hex Drive Head.